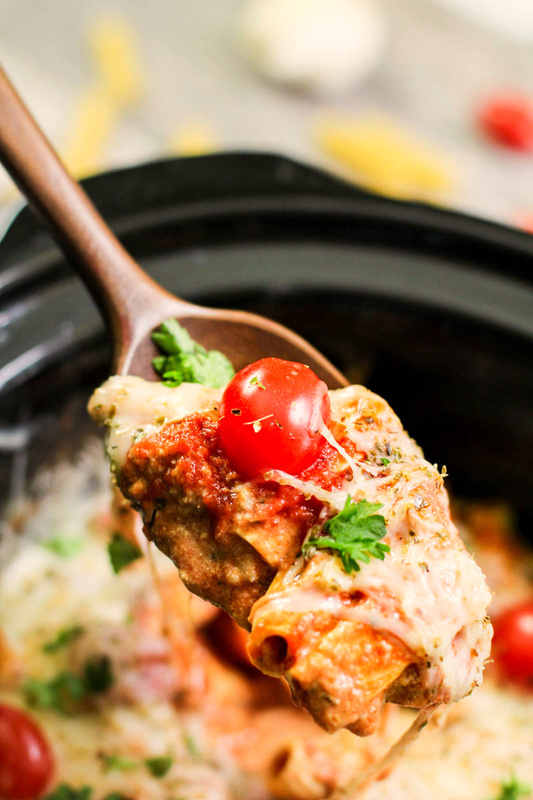 This delicious and creamy slow cooker pizza casserole makes the perfect dinner on busy weeknights! Does your family love pizza night? In our home, we typically order pizza once or twice a month for family movie night. Needless to say, it’s a family favorite and a win-win for this mama since I don’t have to cook. 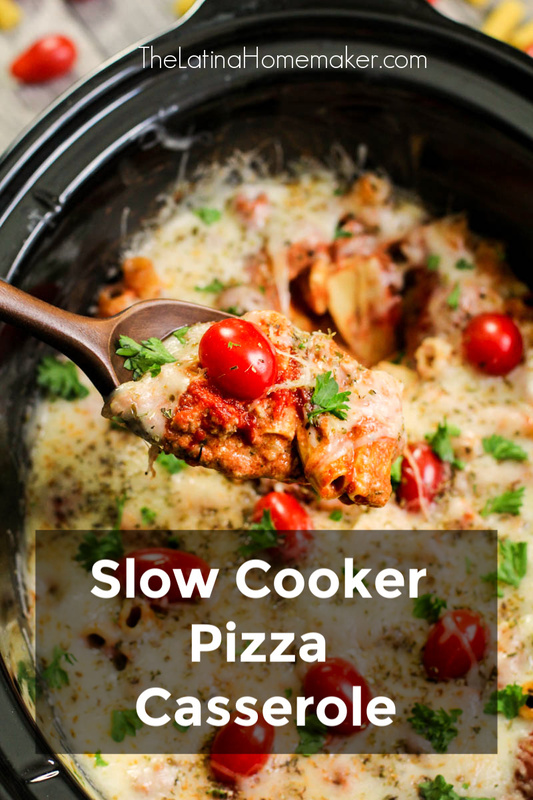 This slow cooker pizza casserole recipe combines the flavors of pizza and can be put together in a short amount of time. I work long hours and often get caught up in work projects that leave me little time to cook. So on weeknights, if it’s not an easy recipe, I’m simply not making it. Save time and skip the prepping! Cook ground sausage and onions over medium-high heat in a pan. Freeze or refrigerate until ready to use. Mix ricotta cheese with other ingredients and seasonings. Place in the refrigerator until ready to cook. If you want you the full recipe, you can scroll to the bottom of the page! Can I use any toppings? 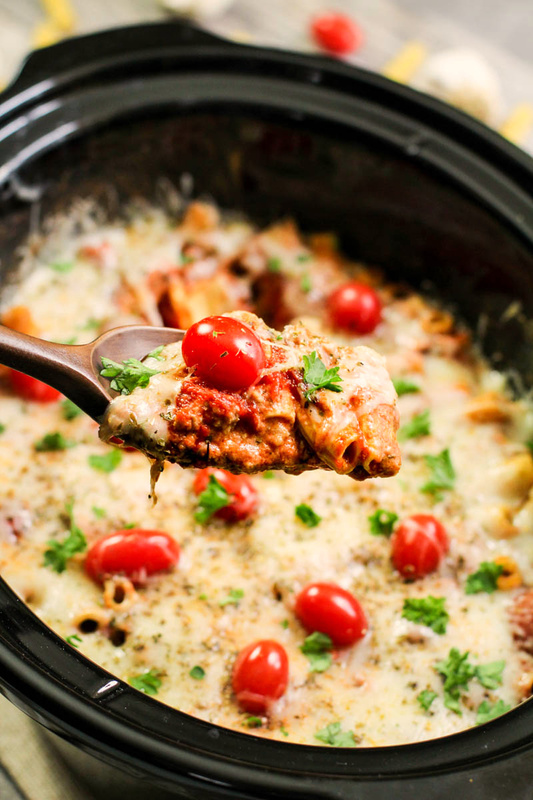 The great thing about this slow cooker pizza casserole is that you can add your own twist by using your favorite pizza toppings and flavors. My kids love Italian sausage on their pizza which is what you’ll find in this recipe, but if your family prefers pepperoni, toss some of those in as well. Should I brown my meat before putting it in the slow cooker? Yes, you’ll need to brown your meat before adding it to the slow cooker. If you want to save some time and skip the browning process, you can also use pre-cooked meat. A few great options are chicken, pepperoni, and ham. This recipe uses pizza sauce, but marinara sauce is also a great alternative. Set it and forget it! You don’t need to stir it or do anything once it begins to cook. 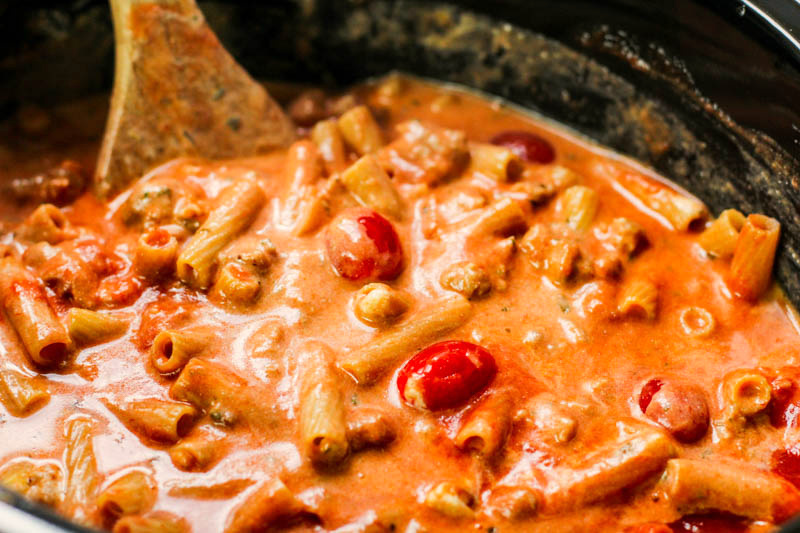 Serve this yummy dish with a simple Italian salad and breadsticks! Heat oil over a medium high heat in a large pan. Add in the ground sausage, and cook for 3 minutes before adding in the onions. Continue cooking until the sausage browns and the onions are softened. Total of about 8 minutes. In a small bowl, add in ricotta, Parmesan, dried oregano, basil pesto, salt and pepper. Mix together and set to the side. 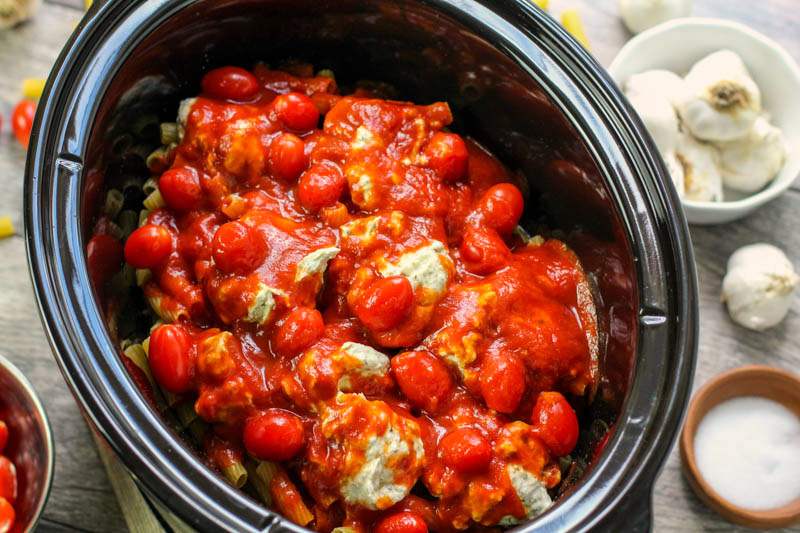 To a well-greased large slow cooker insert, add in 1 jar of pizza sauce. Next, add in your meat and onion mixture to evenly coat the bottom. .Pour in your short noodles evenly. Add dollops of the ricotta cheese mixture on top of the pasta. Next pour in chicken broth, grape tomatoes and top with the remaining pizza sauce. Gently mix all ingredients together and cover. 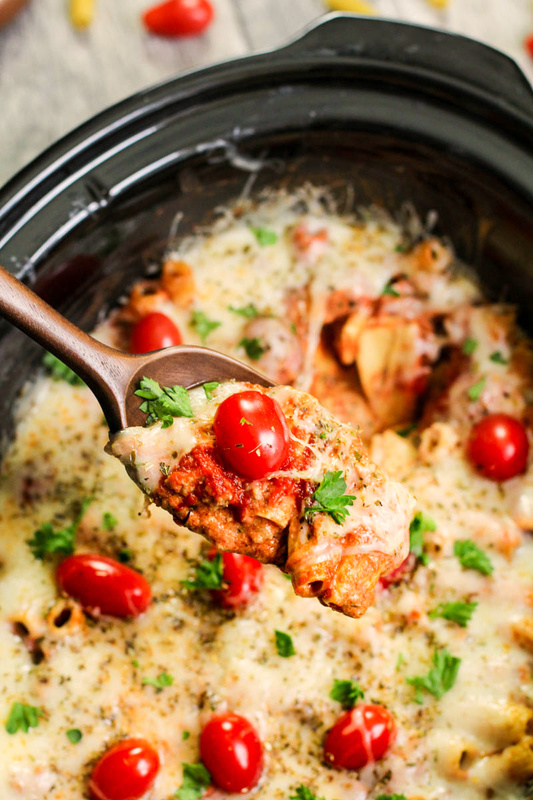 Allow pizza casserole to cook on high for 2 hours and 15 minutes, then go in and top pasta with the Italian cheese blend, sprinkle some additional dried oregano on top, cover and cook an additional 15 minutes to allow cheese to melt. Using pizza sauce will give a more authentic pizza experience. Marinara sauce could also be used. Allow casserole to cook undisturbed. No need for going in to mix it.